It is possible to run a washing machine and a tumble dryer on board your narrowboat providing you can generate sufficient power; either by shoreline, inverter or generator. Space, power generation & water consumption will be the main factors in deciding if these appliances can be accommodated on-board a narrow boat. Unlike some domestic appliances, you do have a wide choice of washing machines to choose from for your canal boat. Not only in size of machine but length of wash cycle, energy consumption and water usage. Size – a standard washing machine is 60cm wide. Although alternative sizes are available it is generally the depth and height that vary rather than the width. 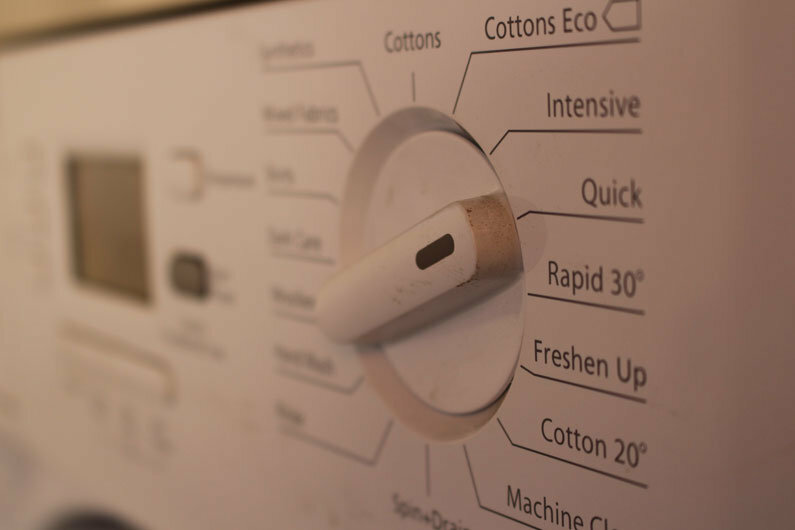 The height of a washing machine can vary from 60 – 90cm and the depth from 45 – 60cm. 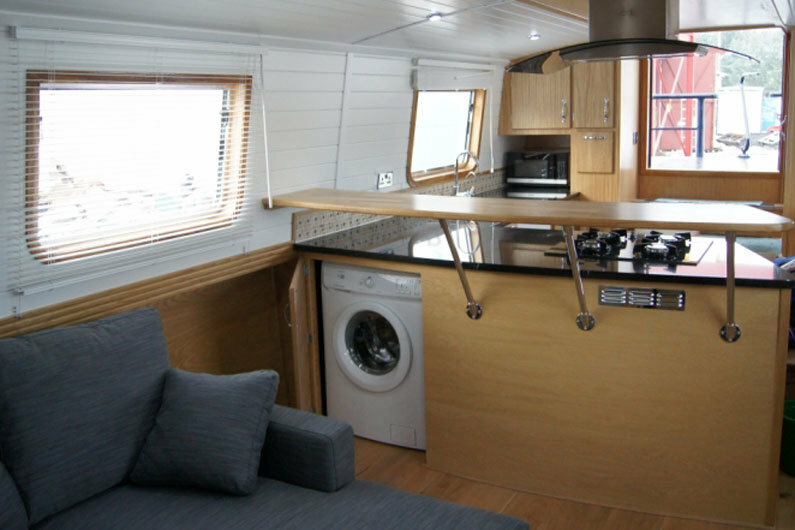 Compact washing machines are available, which may be easier to install in the limited space on a canal boat, but they are considerably more expensive than a standard size one. Water consumption – an average washing machine uses 11 litres of water for every kilogram of cottons it washes on a standard program. However you can find washing machines that use as little as 5.5 litres per kg or up to 14.1 litres. Although this may not be such a consideration in a domestic home, it is on-board your canal boat where you have a limited water supply. Cycle length – although this may not be a consideration in the domestic home, it is on board a canal boat as you may want to reduce how long you need to run your generator for if you are not on shoreline power. Some machines offer a quick wash in as little as 14 minutes. Energy use – an average washing machine uses between 1200 – 3000W so do research carefully depending upon the limitations of your canal boat power capabilities. It is the heating of the water that uses the most power as opposed to the motoring of the machine, therefore operating a cooler wash is certainly more beneficial than a 60 degree wash. If it is not possible to install an automatic washing machine on your canal boat due to either space or power limitations (or both) then there are other more traditional options available. Portable washing machines are very much still available and can range from a simple tub and separate spin dryer to more sophisticated twin tub options. Power consumption with these units is low, around 100W-300W, however they are a lot more labour intensive than an automatic washing machine. Before making any purchase it is important that you check if your inverter is pure sine wave with adequate output to cover the motor starting. A power audit is also useful to conduct to ensure you have the power capacity on your narrow boat. As the washing machine is such a high powered appliance, you will need to run your narrowboat engine to substitute the power requirements if you do not have shoreline power available. Tumble Dryers… Vented or Condenser? Domestic tumble dryers are either a vented machine or a condenser dryer. A vented machine takes the damp air and discharges it outside to prevent condensation. If you are building a new canal boat, the vent could be permanently fitted, or you can simply hang the hose out of an open window door or hatch. A condenser dryer separates water in to a container which is emptied after the dryer has finished or is sometimes pumped out via the washing machine plumping. A standard tumble dryer will use between 2000-4000W of power which isn’t an issue on if your narrowboat is on shoreline power, but a major consideration if you are running through an invertor or generator. 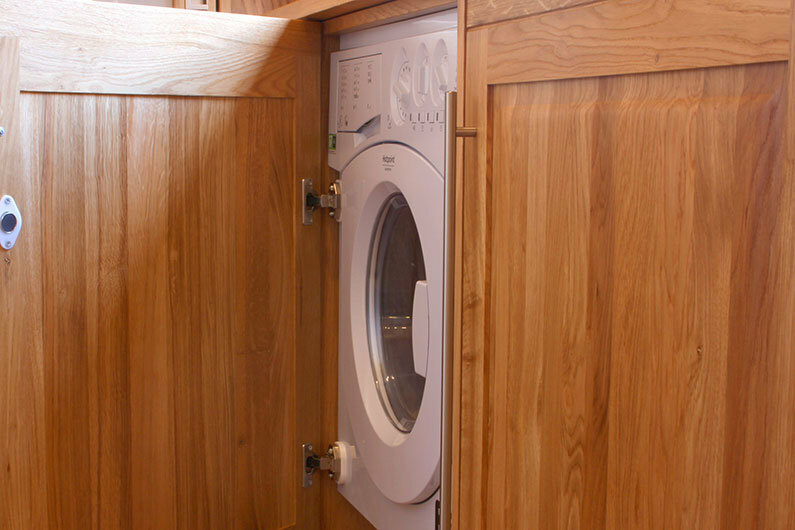 The standard width of a tumble dryer is 60-69cm wide for a drum capacity of 7-9kg. However, compact models can be found which are 50cm wide and 50cm deep but you will sacrifice the amount you can dry as the drums can only hold 4kg. These are a practical space saving solution as they are a combined machine and no additional plumbing or hose vents are required. However you do need to bear in mind that drying time is longer than in a stand-alone dryer as the drums are smaller; it is a wet condenser system so uses cold water for the drying process, thus increasing water consumption. Heated clothes airer – a traditional clothes airer but with heated rails. You will require 230V mains (either through shoreline, an inverter or generator), but they are generally compact and can be folded away when not in use. Depending upon the model they can use around 200W which would draw around 18 amps, which is considerably less than a tumble dryer. Air Dryers – unlike the heated clothes airer above that requires heat to be generated; the air dryer looks very similar to a traditional airer but uses multiple fans to blow room temperature air over the wet clothes, thus using very little energy. As it only circulates air and not heat; it only uses 25W (2 amps at 12V). It still requires 230V mains (either shoreline or an inverter). Again the air dryer can be folded away compactly when not in use. Ultimately you may also have the option to dry clothes outside, however do check with your marina / mooring as in some cases this is banned. Also be very cautious of drying clothes in close proximity of a stove as this can easily result in a devastating boat fire. Washing Machines & Tumble Dryers… Are Laundry Products Safe? Regardless of the type of washing machine you chose for your narrow boat. you also need to give consideration to the laundry detergents you chose to use. In most cases the waste water from the washing machine will go directly overboard and in to the canal or river, which can be very damaging to the environment. On Canal & River Trust waterways, it is within your boat license terms and conditions that phosphate free cleaning products are used. In most cases common household brands are not to be used as they contain phosphates. However there are an increasing number of ‘eco’ brands emerging in to the market which do not contain phosphates which can be used safely.